To check what the new voice sounds like, switch over to any app with text, tap and hold on a word or phrase, then choose “Speak Selection” to hear the new voice. If you want your iPhone or iPad to sound exceedingly proper, it doesn’t get much better than the British English voice of Daniel. I’ve always been a fan of Australian accents so I went with Australian English, but all voice choices are very high quality. 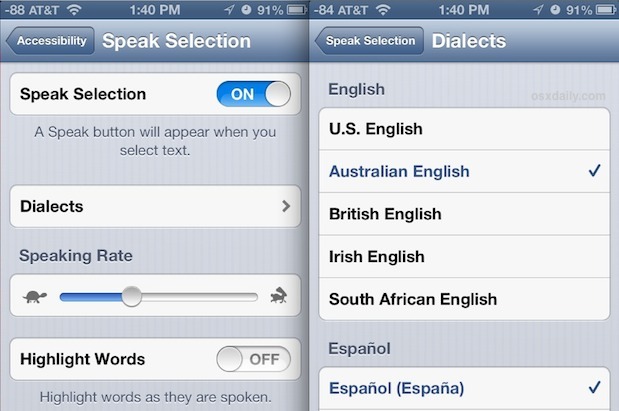 Obviously changing back to the default Siri voice is just a matter of choosing your primary countries language. These voices can also be added to the Mac if you want to change things up there too, you’ll need any version of Mac OS X later than 10.7 to do so. Tessa the South African, yea. I’ve tried this for a long time now. I’m an American, but I love the British accent. However, the only problem is that half of the time when you choose a different accent (for English) it does not work properly. It does not recognize the words or phrases properly. Researchers have tested this. Americans subconsciously find British voices more authoritative. Americans tend to be big Anglophiles. Hi, I’m on an iPad 3rd generation. I have turned on the speak selection and it doesn’t say ‘dialects”? Where can I get a Boston accent voice? No, not a Dorchester Boston accent, but a middle class one like mine? I cannot get the voice to chg on my cell. I go to Settings, Accessability, Speech Nd Voices. I make my choice and it does not work! And I turn Speech Selection on!